Two new vice presidents of Tideland Sig- nal Corporation, the Houston, Texas-based designer, manufacturer and worldwide dis- tributor of navigational aids and solar elec- tric generators, have been announced by president S.N. Sprunt. D. Stenzel, manager, Far East area, Sing- apore. U.S. Atlantic and Pacific fleets. He is a cap- tain in the U.S. Naval Reserve. Puerto Rico Drydock has expanded all facets of its repairfacility with a modern newly erected machine shop. All types of engine repairs and rebuilding as well as complete propeller repairs are provided. Modern plate and pipe shops have been erected with a complete stock of pipes, steel plates and shapes (ABS/LR). New experienced management provide direct individual ship supervision with direct access to U.S. supplies. "For complete detailed services please write for free brochure". 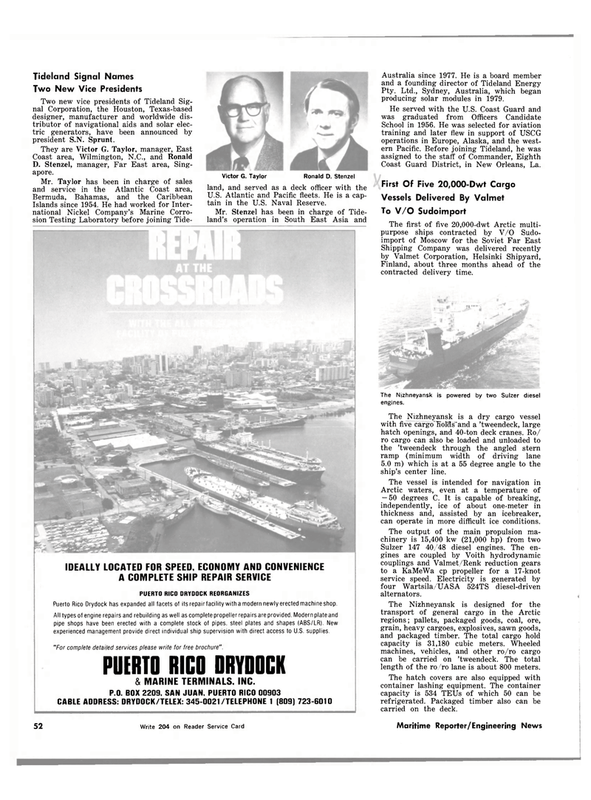 PUERTO RICO DRYDOCK & MARINE TERMINALS. INC.
Pty. Ltd., Sydney, Australia, which began producing solar modules in 1979. Coast Guard District, in New Orleans, La. Finland, about three months ahead of the contracted delivery time. The Nizhneyansk is powered by two Sulzer diesel engines. Arctic waters, even at a temperature of — 50 degrees C. It is capable of breaking, independently, ice of about one-meter in thickness and, assisted by an icebreaker, can operate in more difficult ice conditions. Sulzer 147 40/48 diesel engines. The en- gines are coupled by Voith hydrodynamic couplings and Valmet/Renk reduction gears to a KaMeWa cp propeller for a 17-knot service speed. Electricity is generated by four Wartsila/UASA 524TS diesel-driven alternators.